Vehicles come with their fair share of risks and responsibilities that many claims handling companies do not cover or address adequately. That’s why Nationwide Transport Breakdown Services offers expert claims services and accident management. With over 30 years of experience, we understand your business’s needs and requirements when your vehicle is involved in an accident. We handle your claim and act as an affordable intermediary service to help you get back on the road as soon as possible. Let our expert team take care of the insurance and claim aspects, including Third Party mitigation and repairs, subject to approval and appointment of your insurers. 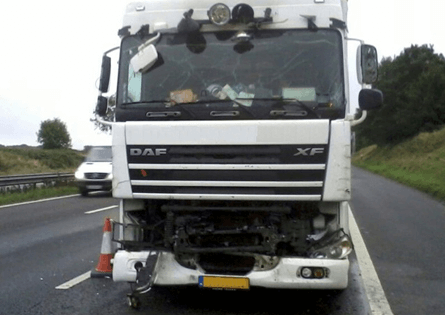 Based in the UK and servicing Europe, Nationwide Transport Breakdown Services aims to support your drivers or operators when they are confused and distressed after an accident. If the accident is non-fault, we can provide a replacement vehicle to keep your business on the road and preserve your reputation. If you would like reliable accident cover, please complete the form or give us a call on 0161 336 8752.